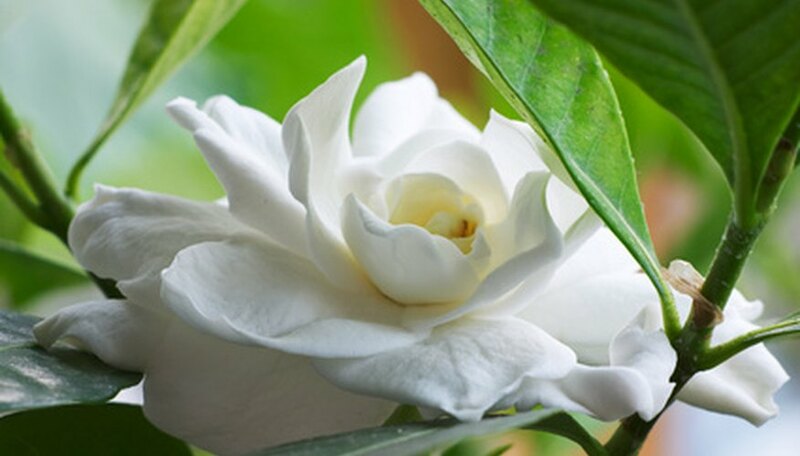 Producing fragrant, creamy white blooms, the gardenia plant is an excellent addition to anyone’s home or garden. The waxy-leafed, shrub-like plant is often used for home fragrance scents and body care products. Because of their ability to withstand weather, pests and disease, gardenia plants are often sought after by gardeners across the United States. You can successfully care for your outdoor gardenia plants and fill your garden with the refreshing scent and presence of gardenia. Plant the gardenia plant outdoors in an area that receives partial sunlight throughout the day. Gardenia plants grow best in soil that retains a high moisture content and is rich in nutrients. The gardenia plants should be planted 60 to 90 inches apart to allow room for proper growth. Apply a thick layer of mulch approximately 6 to 8 inches deep around the base of the gardenia plant. The mulch will aid in preventing weed growth around the plant. Water the gardenia plant depending on the amount of rain you receive in your area. The soil around the gardenia should feel moist to the touch, but not soaked. Because of the gardenias thick foliage and woody stems, the plant requires plenty water. Add a water soluble fertilizer to your watering sessions every other watering. The fertilizer will help maintain proper nutrients to the plant. You can purchase a water soluble fertilizer at your local department store, or a garden specialty store. Prune the gardenia plant once per year during late winter. Because of the time of year, you will not risk damaging the plant. Prune away any dead, browning or diseased branches from the plant. Clip away any tall, overgrown branches of the gardenia as well. This pruning will allow proper nutrients to be circulated throughout the plant, allowing for optimal growth next growing season.